Oregon’s education system needs improvement. 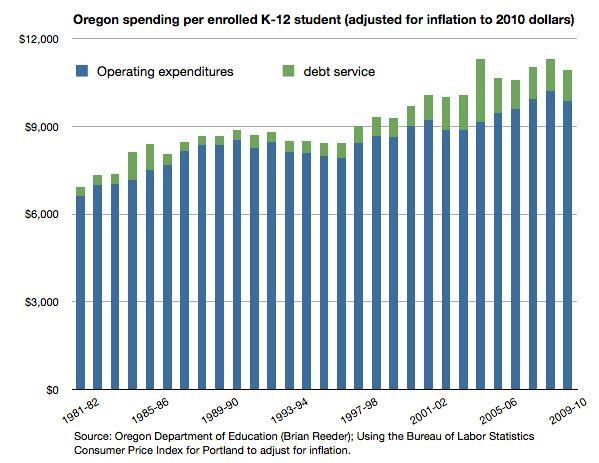 But not the kind of top-down improvement now being orchestrated by Oregon’s governor. Consider that one in three Oregon students fail to graduate high school on time or with a standard diploma. Far too many children who do graduate lack the basic skills they need to succeed in life. Of students who graduate, 70% enroll in college within two years of high school graduation in the U.S., but around 30% of students drop out, and many more fail to graduate on time according to the NCES (of the U.S. Department of Education). One major cause is that students are commonly unprepared for college-level work. Around 40 percent of Oregon’s community college freshmen enroll in remedial courses. Surveys by the NCES have found that about 1 in 4 freshmen in four-year public universities enroll in remedial courses. Students who take remedial courses are far more likely to drop out of college. Yet startlingly, in a 2008 survey only 14% of such students thought their high school coursework had been difficult. For decades, the Status Quo Lobby has complained continuously that the problem is “lack of money” and “budget cuts.” Yet, the Department of Education and the NEA’s (part of the Status Quo Lobby) own figures show that Oregon spends more than $11,000 per student on average! Over the last 20 years, spending has increased significantly, even after adjusting for inflation! Oregon is average nationally for education spending but ranks a sad 43rd in achievement, according to the well-respected Education Week’s Quality Counts 2011. In fact, Oregon’s public schools are spending far more than you may realize, but every spending increase has failed to realize any true statewide improvement. The status quo solutions haven’t worked. Isn’t it time to try something different? Learn about the solution here.